Domus Praetoria is a family driven business, we welcome all our guests with passion and attention for details. As we are tireless travellers ourselves, we understand the need to travel on a budget and the difficulty in finding the right place at the right price, without giving up the basic standards. 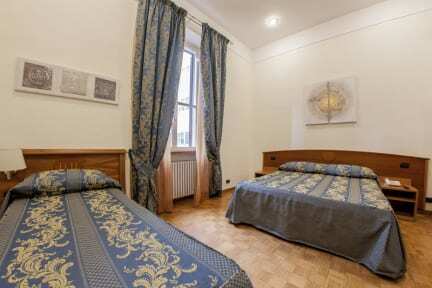 Domus Praetoria is at 5 minutes’ walk from Stazione Termini, the main city hub connecting airports, ports, metro and busses lines. The area is safe and well connected to museums, libraries and historical sites. It is full during the day with cafes, restaurants, supermarkets, street markets and embassies. There are many pubs and clubs nearby attended by locals and travellers from all over the world. The city centre and the San Lorenzo are accessible within 10 minutes taxi ride or by walking for the most adventurous. Busses and trains from and to the Airports (Fiumicino and Ciampino) leave every 15-30 minutes. The Station is also the main stop for Busses lines and for the subway system, both Metro A and Metro B lines stop here. 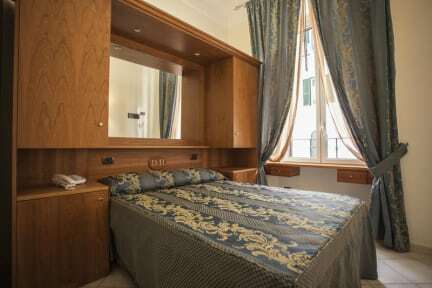 We provide our guests with the comfort of a private room with private bathroom. All the rooms are clean and spacious, recently refurbished to provide you with free Wi-Fi, smart TV, private bathroom, air conditioning and safe boxes. Check out from 08:00 to 10:30. Breakfast not included, price varies from 3 to 5 euros according to the menu you choose. Reception open from 8 am to 8 pm.